Now your guests will really know what time it is...Java Dream! This beautiful clock is encircled by a brilliantly lit yellow L.E.D. lights. The fifteen inch diameter frame has a mirrored chrome dipped finish. 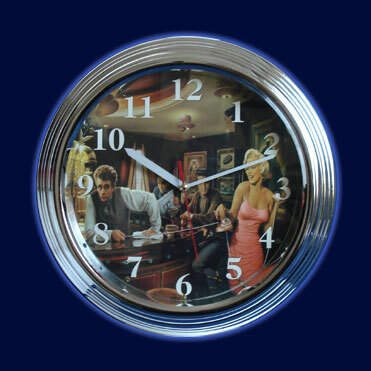 This neon clock will brighten up any game room! Lighting Effects: Yellow , blue and green L.E.D. lights..